Written by Steve Perry (a name that should be as synonymous to expanded universe fans as Randy Stradley) and originally published in 1992, Aliens: Earth Hive is an adaptation of the Dark Horse Comics Aliens Book/Series 1 released in 1989. The original comic series originally focused on the characters of Corporal Dwayne Hicks and Rebecca “Newt” Jordan after the events of Aliens. 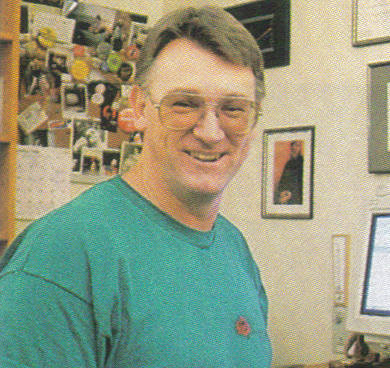 However, when Alien 3 was released and those characters were killed, their comic counterparts were renamed Wilks and Billie and Steve Perry’s adaptation of the series was the first time this change was seen. Aliens: Earth Hive is set decades after Wilks and Billie survived an Alien infestation on the planet Rim. They were the only two survivors. In the intervening years Wilks (I almost wrote Hicks here) has become a tear-away, insubordinate and shunned by his fellow marines and command. Billie eventually found herself in a mental institution, her memories wiped but slowing resurfacing. She is convinced that her memories of the Aliens are nothing more than nightmares manufactured by her mind. And during that time there’s been no other reported encounter with the Aliens. That is until one is found aboard a derelict (as in abandoned, not Space Jockey/Engineer) vessel in orbit of Earth. Using flight data obtained from the vessel they track its course back to the Alien homeworld (later retconned to be one of many hiveworlds) and set off to obtain some samples. Meanwhile, back on Earth, a company known as Bionational has obtained a specimen from the ejected pilot chamber of the derelict ship that was destroyed in orbit. Inside that pilot chamber they retrieve the infected pilot. Like the comic series, Aliens: Earth Hive is a very busy book with lots of storylines and elements being introduced. In fact, a lot of the elements you find in later Alien series can generally trace their roots back to this original story. This includes elements such as the royal facehuggers (perhaps more so the visualization in the comic), religious cults worshipping the Aliens, how the Aliens communicate and more. Perry does a good job in doing what any good adaptation writer should do and that is in clearing up any unclear points from the source material – in particular I think Steve Perry does a very good job in making Billie’s background less confusing. He makes it perfectly clear she was forced to believe that her memories of Rim and the Aliens were nothing more than nightmares, when in reality they were caused by an imperfect attempt to wipe her memory of the incidents from her past. When Wilks is brought back to active duty to participate in the mission to the Alien hiveworld, he discovers what became of Billie and a visit to her triggers her memories. Learning she is to lobotomized as a cure for her “nightmares”, Wilks breaks her out of the institute and she asks to go along with him to face her fears. I thought the handling of that situation for Billie was very well done – especially as the trilogy progresses it becomes more and more about Billie’s character than any of the others and I think its important that her backstory is well defined and clear. However, I also felt that Steve Perry missed an opportunity to clear up something from the comics that I never felt was done correctly. That is the relationship between Billie and Mitch Bueller, one of the marines who accompanies Wilks and Billie to the Alien world. It becomes quite an interesting dynamic as the series progresses but the start of their relationship is handled in what I feel is a very immature manner. Mitch and Billie become intimate enroute to the hiveworld which isn’t a problem. It’s that they instantly fall in love with each and it feels almost as if an adolescent fan wrote the story. The problem also occurs in the comic series but it feels more obnoxious in the novelization. I think a more interesting angle to have explored would have been their connection to each other because of their emotional immaturity – which leads me to something I think Steve Perry made worse compared to the comic series: Bueller and his whole squad are actually synthetics that are designed to be as close to human as possible. The Colonial Marine ship, the Benedict, is intercepted by a Bionational ship who are sent to ensure the government doesn’t return with their own samples of the Aliens. The commander and his crew boards the Benedict and there are casualties. The problem with this is that are numerous instants where we see or hear of the synthetic marines being killed and yet no mention of their white body liquids. This is not a problem in itself but it also comes as a surprise to our main antagonist when he learns of their true origins. 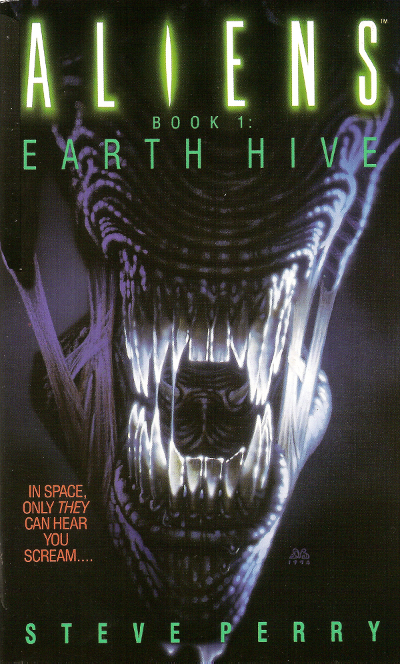 Mark Verhieden built up to the reveal better (and I suppose the original black and white interior artwork helped) but within the narrative he had moments where it was being foreshadowed properly and they were nowhere to be seen in Aliens: Earth Hive. I feel that Perry could have done a nice job at making this mystery less of a “how does that work? !” moment and more of a “holy crap!” moment like it’s intended to be. I also was not a fan of Perry’s use of language in Aliens: Earth Hive and some of his awful dialogue that isn’t in the comic. In particular are his moments when he’s trying to capture the charm of Hudson in Aliens but instead we get some cheesy and quite frankly cringe worthy moments: “Eat hot plasma death, alien scum.” There’s also an apparent obsession with uttering “Buddha” every few pages. Another issue I had with the comic series that ported across to the novelization was in the terminology. The weapons are called blasters, the APC has become some sort of amalgamation of a dropship and APC. It’s a small issue but one I find quite grating and could have been one that was fixed by Perry for the novelization. It just didn’t feel as if it was properly part of the Aliens universe. I realize I have had a good whine above but it’s not all doom and gloom. I was quite fond of the characterisation of Wilks and Billie. I enjoyed the direction that Verheiden went and how Perry fleshed them out. I know they’re not intended to be Hicks and Newt in the Aliens: Earth Hive but I could really hear Biehn and Henn in my head when reading them. 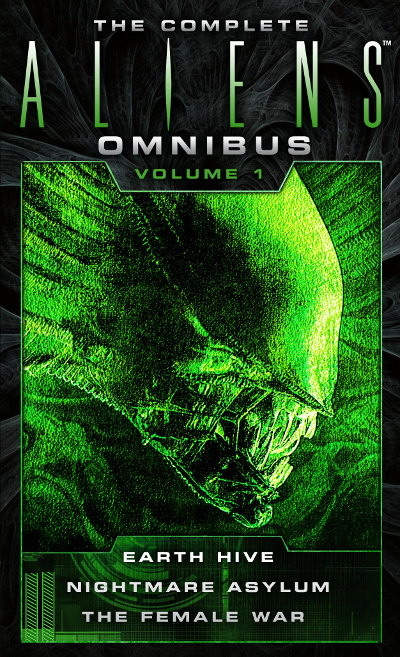 Cover art for The Complete Aliens Omnibus: Volume One, containing Alien: Earth Hive, Nightmare Asylum and Female War. Aliens: Earth Hive also introduces us to the concept of religious worshipping of the Alien. It’s an angle I’ve always enjoyed and one I wish we’d have seen a little more of in the later books and comics. I enjoyed how Perry got inside of the head of the organisation leader, Salvaje, and expanded upon their religious beliefs. I also like how Steve Perry did a great job of keeping all the narrative elements in order. He takes a full comic and puts it down on the page in a way that keeps events quite clear and makes for an easier read than the comic. Over all I think Aliens: Earth Hive missed the opportunity to correct more mistakes from the original comic and Steve Perry managed to make the big character reveal messier. That said, I do think it made a very busy comic a lot clearer and easier to follow. As I said at the beginning though, I do think this is an essential read for anyone interested in the original Aliens expanded universe. It’s not a perfect novel but it’s also by nowhere near being the worse. From Corporal Hicks at AvPGalaxy I award Aliens: Earth Hive with 6 out of 10. You can also read our review of Aliens: Nightmare Asylum and Aliens: The Female War.